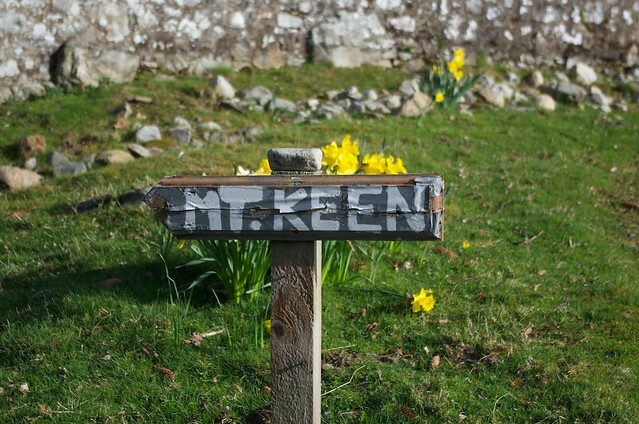 Mount Keen is my local Munro. 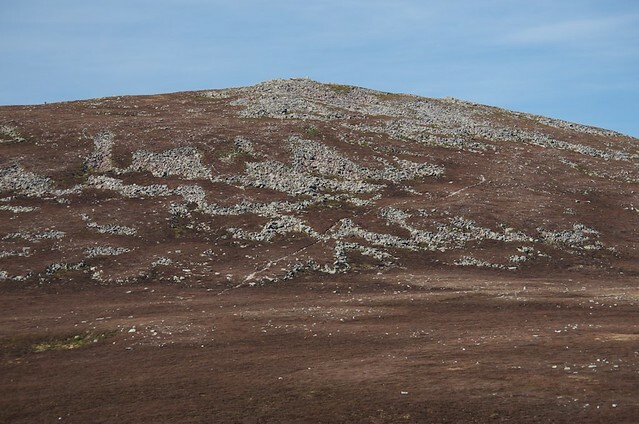 I'm beginning to lose count of the number of times I've visited this hill, munro bagging, charity walks, dragging my daughters up there, and just dandering up there for pleasure. 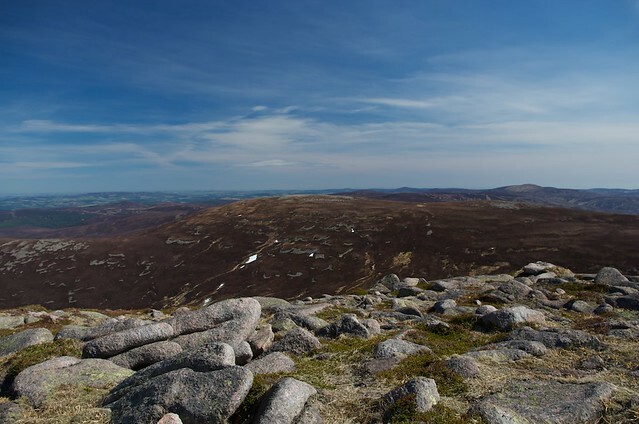 I normally do the trade route from Invermark in Glenesk, but I've done the Glen Tanar route, and a westerly route over Craig of Doune over the rolling landscape and up the west face. 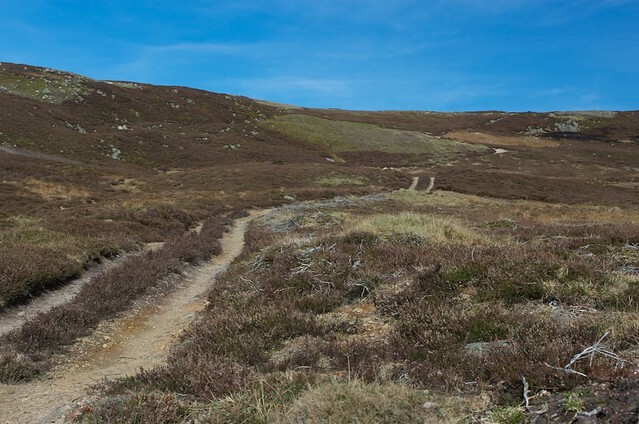 This walk involves a bit more mileage, a bit of descent and ascent, and takes in another couple of hills to the east of Mount Keen. Good if you don't like meeting folk on the way up! I never seen a sole until I arrived at the top of Mount Keen. 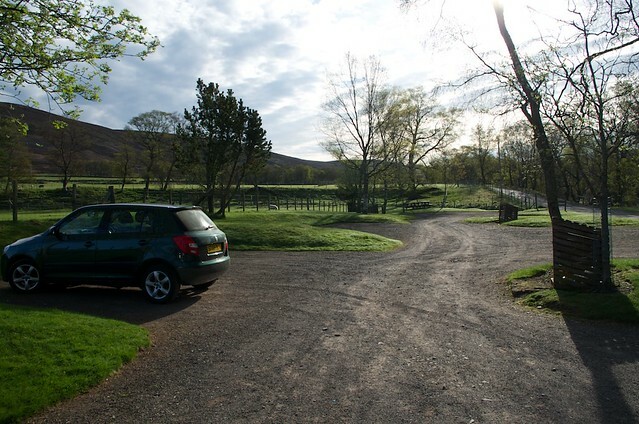 I arrived at the carpark about 0830. It was very quiet. Molly was certainly up for it. We headed up the normal route, passing the route sign. 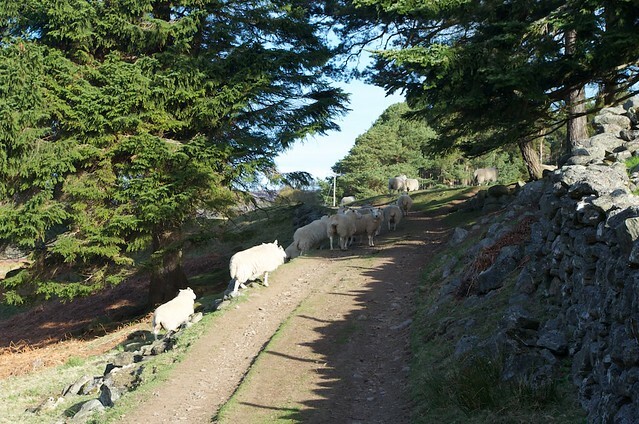 The locals were also heading towards Mount Keen. We headed along the track, turning up the Landrover track at around NO 433814. 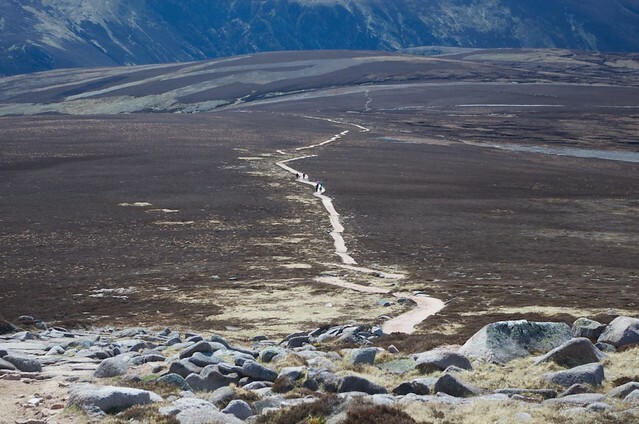 A good track leading into Glas Coire. The views as we gained some height were excellent. And, it was getting warm. We continued along the track, which faded out a bit further on than the 1:50k map suggests. In fact, it went almost all the way to Clash Rodden (shown on the 1:25K). It did become very boggy though and it made me wonder at the ground that the keepers can get Land Rovers into. There were fresh tracks almost all the way to the track end. 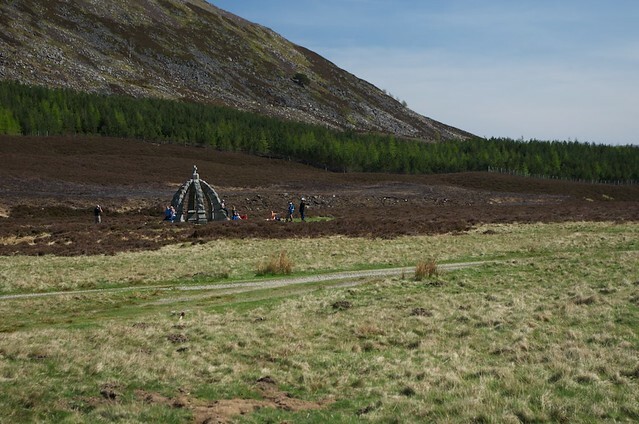 We kept to the burnt patches of heather and gradually started making our way up the east side of Braid Cairn. It was hard work heather beating in that heat! 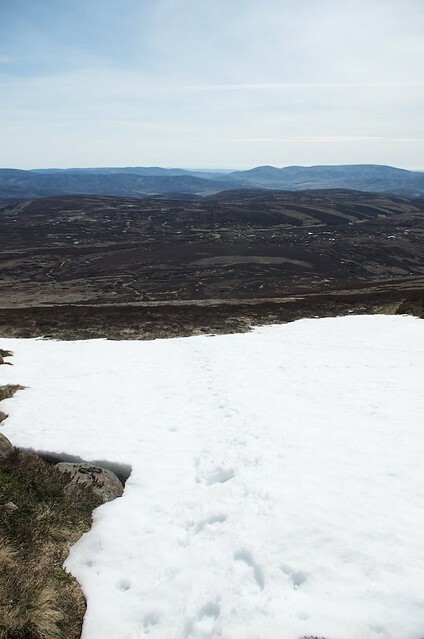 The odd big patch of snow on the ascent of Braid Cairn. After we reached the plateau, it was a fine wander to the summit. 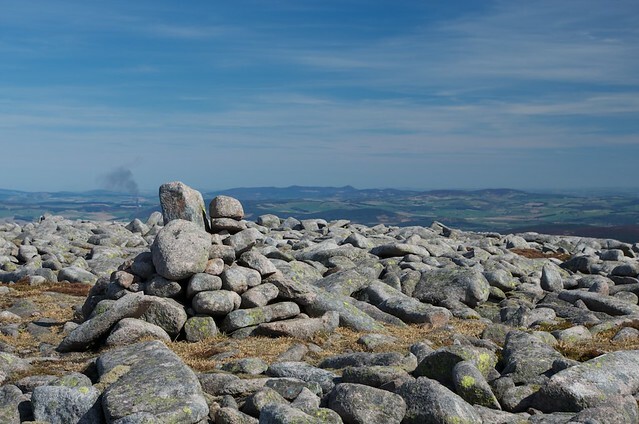 Although rounder, Braid Cairn has some nice features. Here, looking over to the east face of Mount Keen. Looking at a very distant Driesh and Mayar. 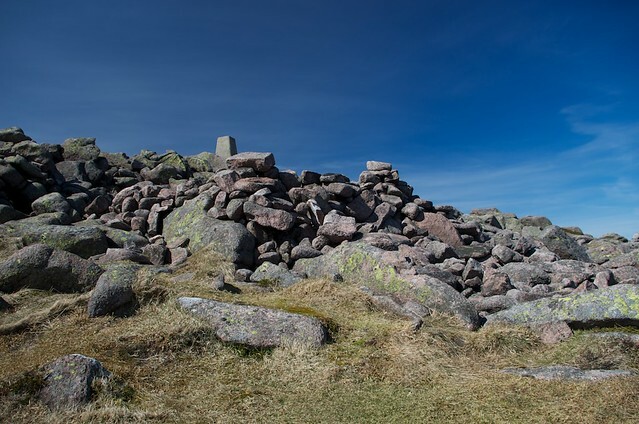 The summit cairn of Braid Cairn. Could see a big bonfire in Aberdeenshire and Bennachie. 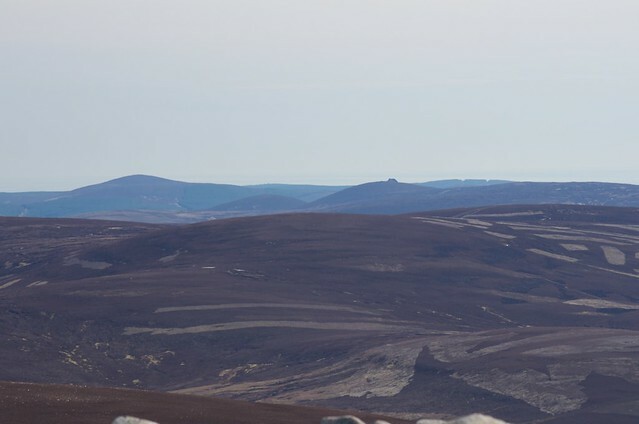 A distant Clachnaben from the cairn. 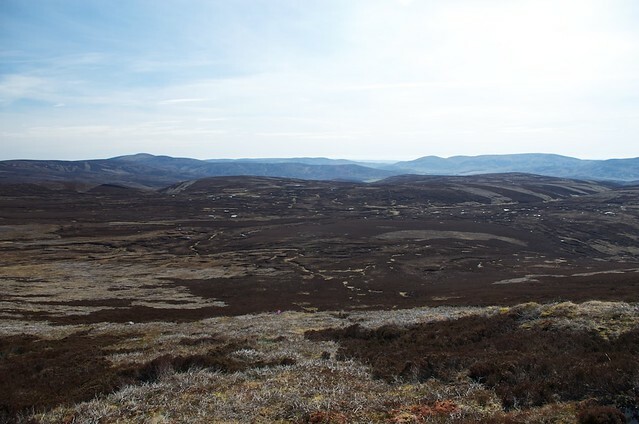 From here, it was heather bashing down to the 765m bealach, and up to Mount Keen. Amazingly, there was a reasonably good path from here to the summit. Finally after much grunting, we were at the top of Mount Keen. 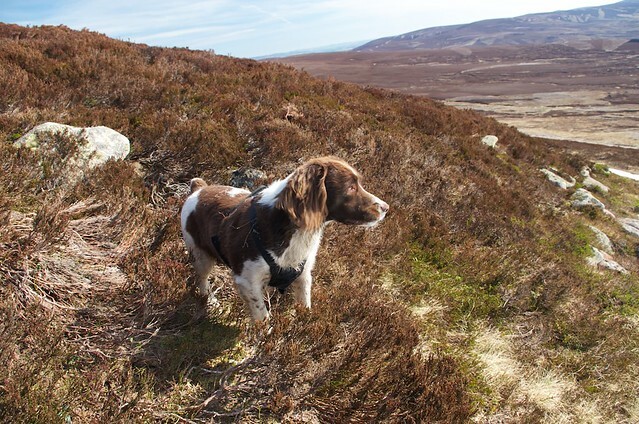 Looking over at Braid Cairn from where we'd come. It was a busy hill today, we passed dozens as we headed back down towards Glenmark. 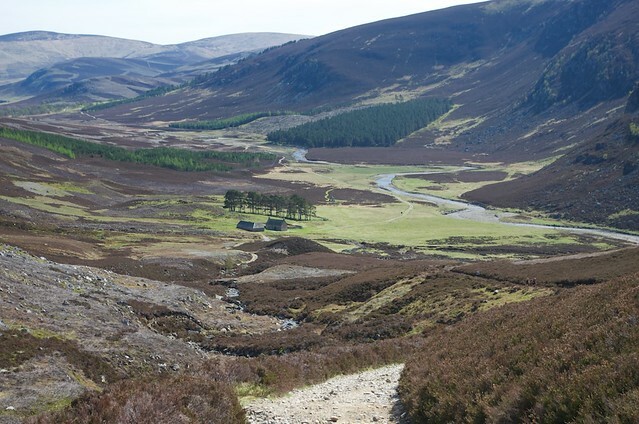 A great walk in the Angus Glens. My GPS went bammy, so I've attached a GPX of the route I planned. Yes, it was cooking! The hill was bone dry, the springs were dry and had to descend almost to the Ladder Burn to get a drink. Beware if you are drinking up there though... I read "Balnamoon, the Rebel Laird'" and apparently he escaped the redcoats by suggesting they drink from the Poison Burn at the back of Glenmark Cottage. Apparently it gives you crippling colic! 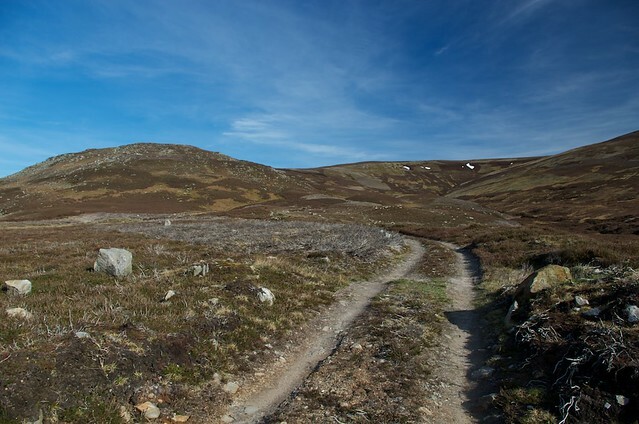 my local munro too, never thought to go via this route. Looks like very hard work as I am a bit of a moaner about ascent and descent repeat! Today was blistering, I was up Corwharn and enjoyed the whole place to myself. 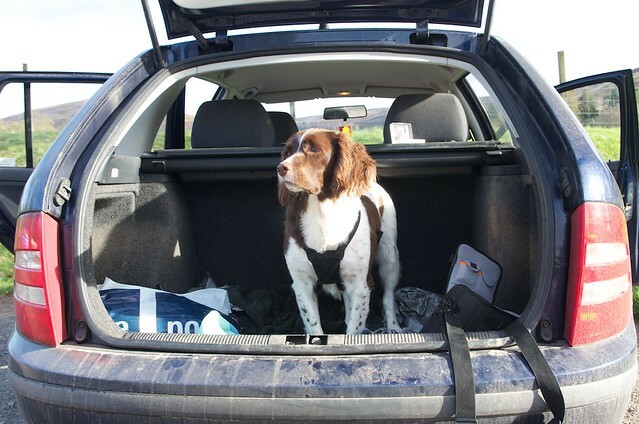 I forgot my water and was gasping by the time I got back to the car! 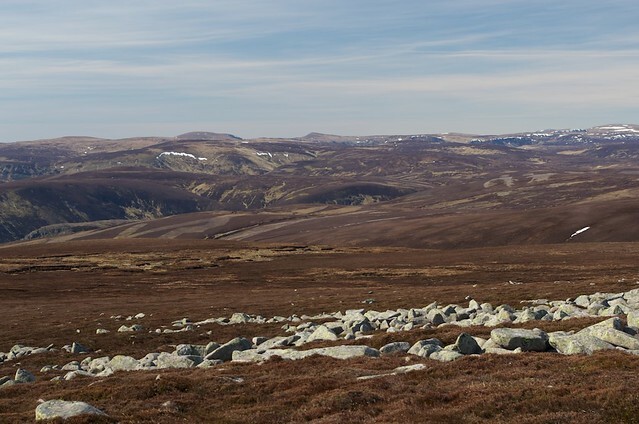 Mount Keen at the end of a ridge walk from Hill of Gairney, Naked Hill, and Braid Cairn. Height gained following landrover track up past Auchronie Farm going over Hill of Kirny and Hill of Saughs and passing near the top of Hill of Gairney (756m) where a line of old fence posts lead across to a Boundary Stone on Naked Hill. 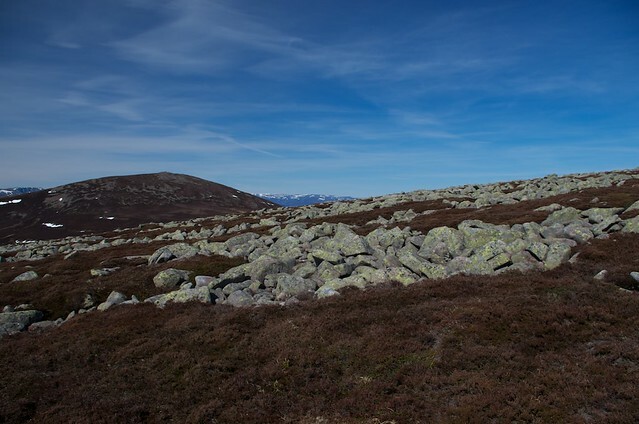 Not much of a drop down to the col (698m), before a long slog up a steep heather slope on to Braid Cairn (887m) and a Boundary Stone. Headed to Southern top on Braid Cairn and, after following a bearing in heavy rain and swirling cloud found a good path leading down to the next col (765m) and up on to the summit ridge of Mount Keen. 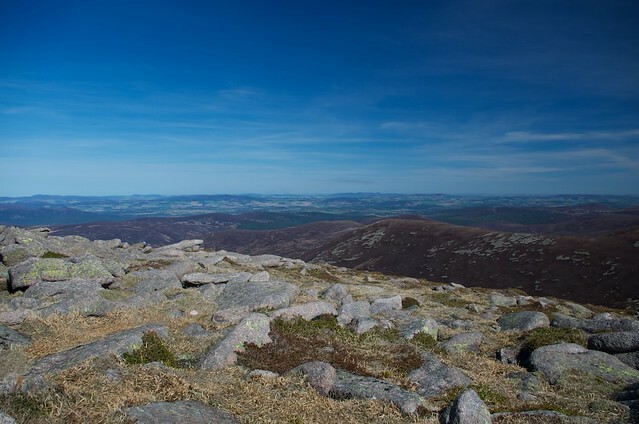 Reached this ridge at a Boundary Stone, for where there was a quick walk from the Northern side of Mount Keen up to the large shelter cairn and trig point (3081' /939m). 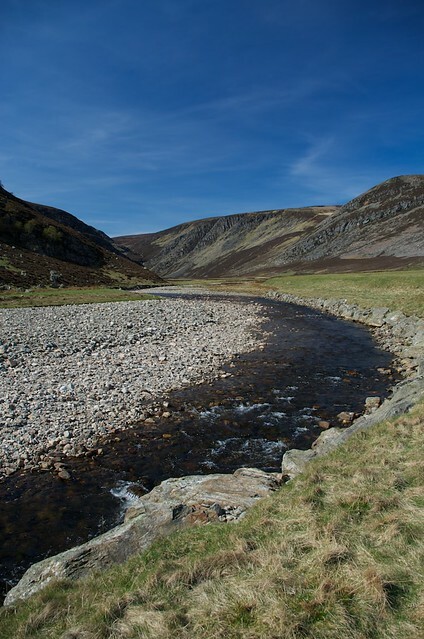 Easy return, past another Boudary Stone, by the main path down to Glen Mark and back to the car at Invermark.